This is the headpiece of the 2.75 meter stele from Xian, China erected in 638 AD. Photo credit: David Castor, Wikimedia Commons. The stele (called "the Nestorian stele") testifies to a large Chinese Christian community connected to Syrian Christians further west. It provides a potential link to Christian activity even further east, involving The Gospel of Matthew. A copy of Matthew was found in Chinese script in Kyoto, Japan, in the Koryuji Buddhist Temple, which dates back to 818 AD. It was built on top of a Christian church building built in 603 AD, which had been ruined by a fire. The "Church of the East" holds that Christian faith reached Japan by 70 AD. Apparently, Syrian and/or Chinese Christian missionaries come to Japan with The Gospel of Matthew to spread the faith. Matthew 3:1 - 12 What is Divine Fire? Purifying or Destroying? Did Matthew Quote Hosea Out of Context? Called a Nazarene - Where is That in Scripture? Did Jesus Abolish the Law and the Prophets? Matthew 8:5 - 13 Is it OK to Want Jesus for Someone Else? Matthew 9:1 - 13 Forgiveness is a Change in...Who? Matthew 9:18 - 26 Do You See Yourself? Matthew 9:27 - 31 Do You See Jesus? Am I Listening to Jesus? Am I Bearing Fruit or Inducing Sleep? Am I Extending Hospitality to Strangers? Am I Receiving Hospitality from the "Unclean"? Am I Paying the Cost Gladly, Like Jesus Did? Do I Value the Kingdom This Way? Can I Leave the Dividing to Jesus? Matthew 17:24 - 27 Sons or Strangers? Did Matthew Get Jesus' Genealogy Wrong? What is Meekness and How Does It Relate to Inheriting the Land? a short paper written by Dr. Bruce Beck, at Holy Cross Greek Orthodox Seminary, for his class on the Gospel of Matthew. Can We Make God's Name More Holy? Might God Really Lead Us Into Temptation? What Did the Suffering Servant Suffer? Does Jesus Hide the Father from People? The Return of God’s Cloud – To the “Wrong” Mountain? a paper written by Dr. Bruce Beck, at Holy Cross Greek Orthodox Seminary, for his class on the Gospel of Matthew. Is God a Mad Dictator Who Kills His Own People? Is Salvation by Social Justice? by Saying Jeremiah in Mt.27:9 - 10? This is a long essay exploring how Jesus' use of the phrase "fire and darkness" is a motif that comes from the story of God at Mount Sinai, where Israel rejects the covenant, and resists being purified by God. I consider Old Testament intertextuality, and virtually all the New Testament texts dealing with "fire" as a motif. 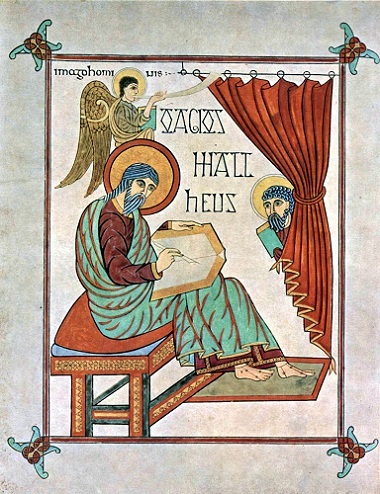 Illuminated manuscript from the Lindisfarne Gospels found in northern England, from circa 700 AD, portraying the apostle Matthew writing his Gospel. Photo credit: Public domain, Wikimedia Commons. The main body of the Nestorian stele (head shown above). Photo credit: Nestorian monk Jingjing, Wikimedia Commons; cropped.